Whether you or your loved one is in need of a live-in health aide or you need someone a few hours a day to help, we have plenty of options. In Your Golden Years is licensed and insured and our team members are fully screened, highly trained and supervised to help you in all in-home care needs. Our home health team utilizes the expertise of registered nurses, home health aides, physical, occupational and speech therapists and other professionals to meet your personal care needs. Our team members also provides personal support services including meal prep, light housekeeping and transportation to and from doctor appointments and running errands. There is no place like home whether you or your loved one is in need of care after a medical procedure, recovering from an illness, receiving on-going medical treatment, or he/she is disabled, home-bound, chronically or terminally ill.
Our compassionate team will always listen and accommodate the health concerns and unique circumstances you are facing and be there for you. Call us today for an in-home evaluation at (989) 892-7572. You can be confident our dedicated team will exceed your expectations. 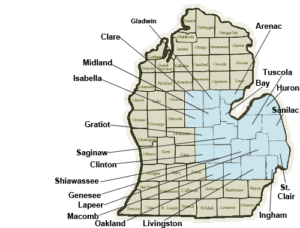 Arenac, Gladwin, Clare, Isabella, Midland, Bay, Huron, Sanilac, Tuscola, Saginaw, Gratiot, Clinton, Shiawassee, Genesee, Lapeer, St. Clair, Macomb, Oakland, Livingston, and Ingham.